Now offering a complete bolt in solution for your problem plagued carbureted engine. Say goodbye to hard starting, rough running, low power and stay all genuine Toyota to preserve the retail value of your Landcruiser. This kit fits all 1958-1992 Toyota Landcruisers that originally had a F, 2F or 3F carbureted engine. 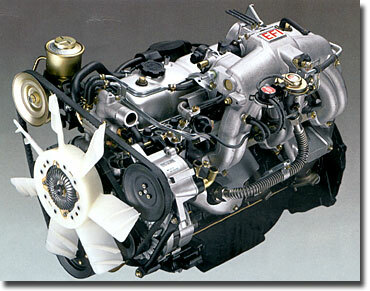 A Toyota Landcruiser 3F-EFI gasoline engine conversion. Complete kit only $2,500- / The engine used is removed from a 1988-1990 Toyota Landcruiser. After we get a placed order we pull the engine, get compression information and mileage for you. Engines used for the conversion kit are typically in the 100k-150k mileage range. Takes roughly 2-6 weeks from the date of your order before it ships. A rebuilt engine adds $2,000 to the total price and 6-8 weeks to the total delivery time. Rebuilt engines are a rebuilt long block, not the external accesories. New/Rebuilt external accesories can also be supplied for additional money. Please plan accordingly. 1988-1990 Toyota 3F-EFI engine assembly / Installs in place of original F, 2F or 3F / This is a USED (Not cleaned) engine. Computer / Install inside or below glove box. Custom wiring harness / Lays out inside engine compartment. Requires some taps into existing electrical system. Gas pedal and throttle linkage. Must custom mount to 40 series firewall. Direct bolt in on 60 series. Fuel Pump Inline Style / Mounts between battery tray and the charcoal canister. Or along frame rail. Coil/Igniter / Mounts in place of factory coil/igniter on passengers fender. Air intake Hose set, you can use in a few different configurations. FJ62 ABV Valve / VSV Unit / Mounts directly on drivers side fender in existing bolt holes. Down Pipe Set with O2 sensors / Exhaust shop can fabricate from these. These are included for flanges only. Emission control components can remain hooked up and this is a 50 state smog legal engine. Your original transmission clutch and bellhousing will bolt directly to this engine. The engine mounts will bolt in directly. No welding or cutting! Some stuff we can leave installed and you can hook up when you bolt it in. E-mail tech support included. Please allow 2-3 days before a response. We DO NOT offer technical support via phone. There are no instructions included. 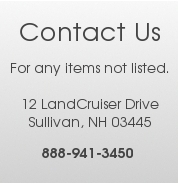 Or email us any other questions. Radiator shroud for 1975 and newer FJ40 lowered 1.5"
1988 Yellow plug style shown. This allows you to install a donor FJ62 engine into your Land Cruiser easily. Basically you just plug this in and run a few optional wires as wanted. The battery power, switched on power along with tapping into your starter wire. We do not install the sleeving as most customers like to do custom wiring runs.This conversion harness is available as a seperate item for $650 + $100 core charge. Refundable core if you have an intact dash harness from your donor 62 series. Computer/relays and tagging available upon request for additional charge.